The calendar allows you to see what events are scheduled and what events have been completed for each athlete. 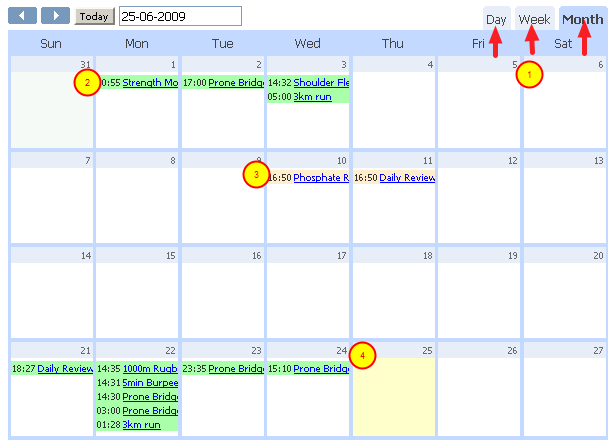 All of the events for an athlete are stored on the calendar. 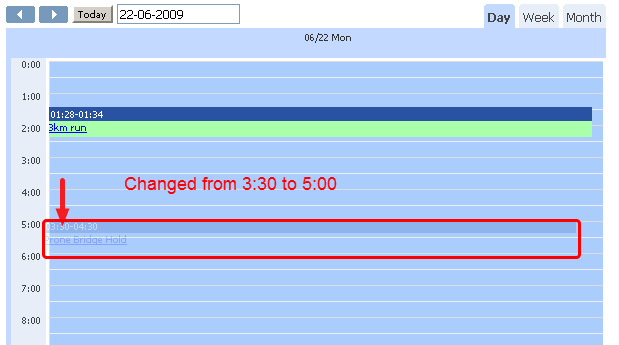 #2: The Green highlighted events represent information which has been "Saved and Closed" as Completed information. #3: Orange highlighted events represent Draft events which need to have additional information entered into them, which will then be saved as completed events. To view the information entered as a Draft or a Completed event, simply click on the event name (blue link) and it will open in a new window for you to edit or review. To Enter a new Event click on the "Enter New Event" to enter for that athlete on the top right of the calendar page. You can drag any event to a different day/time if there are clashes between testing etc. Mouse over the event and when the mouse arrow turns into a black 4-pointed arrow , use it to drag the event to a different day/time, as shown here. All Training Blocks that have been applied to the athlete will appear on the right of the calendar. 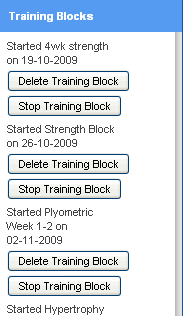 All of the training blocks that have been applied to an athlete will be listed on the right of the calendar page. You can delete or stop any training blocks and only data which is planned will be removed from the calendar. All data which is marked as "save and close" or "Save and lock" will be retained. If you delete or stop a training block ONLY planned sessions will be removed.